« Don’t Throw those Shrimp Shells Away!! Tonight for dinner, I had a couple of acorn squashes that I had bought about a week ago. My family for the most part, is not overly fond of acorn squash, so I keep trying to make it more interesting. Because afterall, the fall is squash season. Well, I cut them in half lengthwise and with a spoon scrapped out the seeds and the stringy stuff. Spray a cookie sheet with Pam or something equivalent. 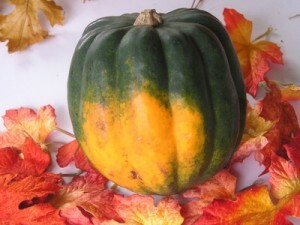 Put the squash skin side up and cook for about 30-45 minutes depending on the size of the squash. They will be done when a knife inserted goes in easily without resistance. Remove pan from oven and turn the squash over. Put a pat of butter into each of the squashes and sprinkle dry ingredients equally into each squash. Put another pat of butter on top. Put back into oven for about 10 minutes, until bubbly.